All the comforts of a Modern Home nestled in 3 acres of Secluded Woods. Set on a beautiful cove on Douglas Lake, this property is perfect for families or friends who enjoy diverse entertainment. The lake provides excellent swimming, fishing, and water sports; and the location gives quick access to all the attractions of Sevierville, Pigeon Forge, and Gatlinburg. Dandridge, the second oldest town in Tennessee, is just 10 minutes away. Douglas Lake is one of the best fishing lakes in Tennessee! Our particular cove has good fishing and excellent swimming right off the dock behind the house. The dock sits in 15-25 ft of water from late April until September, and is protected from lake traffic, so its convenient for both swimming and boating. The closest boat ramp is just 5 minutes away. Enjoy any of these nearby activities or simply stay at the house and relax, watch the deer and wild turkeys, and enjoy the beautiful vistas. We have also expanded the deck and added a gazebo. Pets allowed on a case by case basis. We require an additional $100 cleaning fee per pet. I was very satisfied with the size of the house, the nice decks, and Paul's promptness when I needed my questions answered quickly. Those two things alone are huge! The house is very close to a marina, and we really enjoyed renting a speed boat for several hours, to explore the lake. My main negative was that the lake access was not exactly what I had hoped. While the dock is nice, and the stairs leading to it are adequate, the ramp which connects the dock to the stairs was not good. The night we arrived, I wanted to go down to the dock to take a look. It had been raining, so the stairs were very slick in several places. (Perhaps some bleach on the stairs could remove some of the mildew.) Thankfully, there are hand railings all the way down, so this was not a problem until we got to the ramp. There is no hand railing on it, nor are there enough boards nailed on top of the ramp every so often, to stop your foot if it slides. The angle of the ramp was very steep, which made me think the water level of the lake must have been low. (Ironically, two people at the Marina told us the lake water level was high.) So, I was afraid to go down to the floating dock itself, for fear of sliding off the ramp, or not being able to get back up. This problem could easily be remedied, and if he reads this review, I feel as though Paul will address it. There were other minor details which might have enhanced our experience, but overall it was more positive than negative. This property is in terrible need of extermination. We have stayed in mountain homes/cabins many times and not had this issue. Ants were everywhere, even in our bed while sleeping and crawling on us while we sat on chairs in living room. Although the toilets, sinks, showers were clean, there were cobwebs throughout the house. I killed a huge spider in our bathroom. The hot tub is not in working condition which disappointed our kids. Stayed at this home for six days in July. 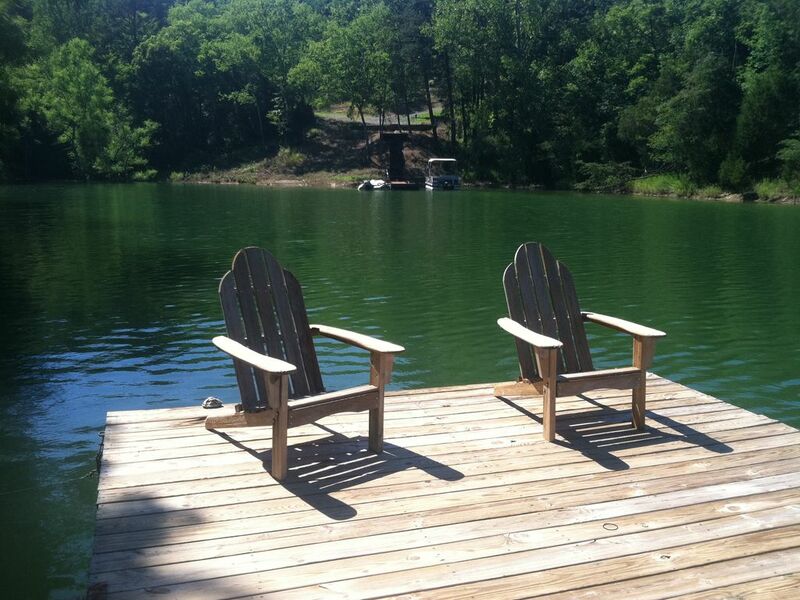 Great location with private dock on a secluded cove. Quaint town of Dandridge is 10 minutes away, boat rental close by, and less than an hour from Pigeon Forge, Gatlinburg, and GSMNP. House is very functional, only complaints are around cleanliness and stocking of supplies. Bathrooms could have been cleaner and we had to run to town to purchase toilet paper, ant spray, paper towels, etc. Otherwise family had a great time, will definately go back to Douglas Lake. Perfect property for relaxing vacation. Stairs were a workout.... which I didn't mind! Great vacation spot without the tourist traps. The well kept house is great for family and friends to meet for a relaxed vacation. Great swimming with a large dock in a deep cove. Gas stations and stores are nearby for your basic shopping needs. Hiking and boating opportunities are close by, as well as other bigger attractions approximately 40 minutes away. The only potential drawback to the property is the amount of stairs leading down to the dock. Those with small children or disabilities/health problems would not fare well with the ascent. This is a beautiful home with lots of space. My family and I enjoyed our stay and maybe could return someday. Thanks Paul!! !